The southern part of the old Munksjö factory located at the centre of Jönköping is developing as an attractive place for trade, offices and apartments. The unique part of this project lies within the project of the three finished steel and prefabricated concrete constructions, as well as glass facades manufactured, supplied and assembled by the company UPB from Latvia. The useful area of the new and central district of the city Munksjöstaden covers 125 000 m2. Detailed design for phase one has been developed, and there is one in progress for the phase two. At least 105 000 m2 will be allocated for 1500 housing units, while area over 20 000 m2 will be allocated for commercial premises. 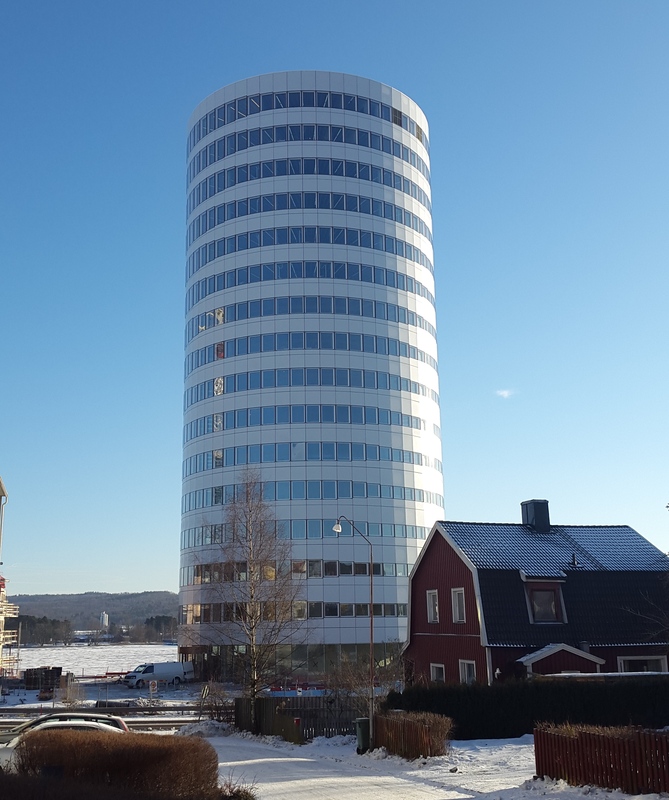 City development in the southern territory of Lake Munksjö is a part of the city construction vision regarding building strategy including 150 000 residents of Jönköping. The territory of the old Munksjö factory is now changing into a new part of Jönköping city and will be connected with the city districts Söder and Torpa in the future. With its explicit character, inherited from the development of the historical factory, this industrial territory is becoming a new district and a busy part of the city. The commercial premises will be occupied by a pre-school and a gym, as well as space for shops and conference halls, which will be located on the 16th floor with view over the lake and the wide fields miles away. The schedule is tight. As soon as the detailed design is approved, all the activities and construction begin. 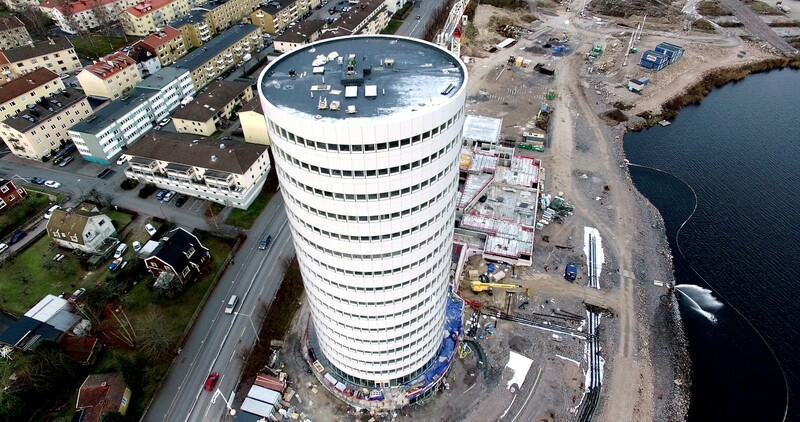 This means that the first block – office building – has been finished in 18 months. Late in the fall of 2014, the Latvian company UPB commenced designing and manufacturing of prefabricated concrete and steel constructions and facade elements. It took 25 weeks to make the building ready for interior works, and this is unprecedented speed. “We have eleven years’ experience in the Swedish market. UPB commenced activity as a three architects’ office in 1991, and currently the company employs more than 1300 people. Our production units are located in Liepaja, Latvia. With the project of three constructions we can shorten the duration of construction and shorten the duration of coordination among various entrepreneurs. Prefacbricated concrete and steel constructions and facades constitute approximately 25-30 per cents of the entire building. For us the Munksjöstaden means that we can offer a ready solution,” tells Edgars Tooms, UPB Sales department director. 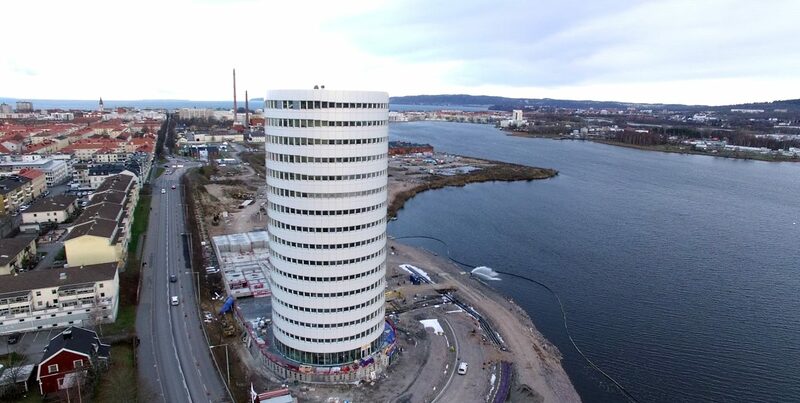 UPB has manufactured and supplied 900 glass facade elements, 300 tons of steel constructions and 6000 tons of prefabricated concrete for the frame construction of Munksjöstaden project. Residential blocks are open with height at various levels – between four and eleven floors. Apartments were of great interest. This area is located in the middle of the city, and people of various age groups are very interested in moving here. The central location and nearness of Lake Munksjö plays an important role. “Since the blocks are created in different ways and use thereof will also be different, this will result in a good mix of buyers and tenants, thus providing an important stability for the location. There were 1600 interested persons for the first 45 apartments,” tells Tommy Fritz. The 16-floor office building will be the first to be revealed. First tenants arrived in December 2015, and moving in continues also in January 2016. There is a gym and restaurant located on the entrance floor, as well as conference rooms on the 16th floor. With the strategically good location the new building will be like Munksjöstaden entrance gate from south, and it will be visible from the highway. The current pedestrian and bicycle path will be moved to the berth-side to promote life and movement in the district, as well as to create the feeling of peace in the vicinity of water and nature. Tolust AB was established in 2007, when two companies Tosito and Lustgården purchased the territory of Southern Munksjö factory at Jönköping. UPB was established in 1991 by three architects, and today the company employs more than 1300 people. In Liepaja, UPB owns manufacturing area exceeding 60 000m2.